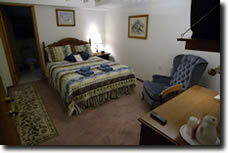 One queen sized bed in the room with a private two person Jacuzzi bathtub and shower in the bathroom. All have a flat screen TV with cable and blue-ray, as well as a desk and private phone. The Bridal and Covenant are on the second floor and have gabled dormer windows. 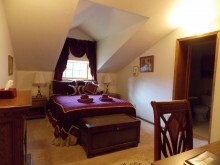 The Master Bedroom has two north facing windows and is on the main floor. One queen bed in the room with a private Jacuzzi bathtub/shower. It is located on the first floor and has a desk, a flat screen TV with cable and blu-ray, and private phone. One queen sized bed in the room with a private Jacuzzi bathtub/shower. It is located on the second floor and has a gabled dormer window, desk, a flat screen TV with cable and blu-ray, and private phone. 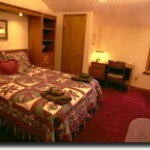 One queen bed and one twin bed nestled in a corner with a private Jacuzzi bathtub/shower. Both are located on the second floor and have a gabled dormer window, desk, a flat screen TV with cable and blu-ray, and private phone. 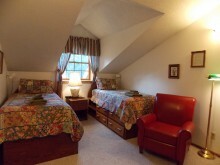 Both have two twin beds and a privately assigned bath outside the room. The bathroom has a shower. Both have desk, a flat screen TV with cable and blu-ray, gabled dormer window and are on the second floor. 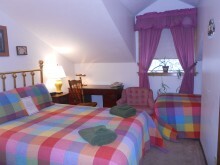 Please call 907 479-0751 to book this room option.